Since I am not going to the grocery store these days I am trying to get the most out of what I do have. I had some nice green onions and when I used them rather than tossing the ends into the compost pile I stuck them in a small flowerpot. In less than a week I have lots of new growth and a steady supply of green onions when I need them. It’s really easy to do. Just get a pot and put some potting soil in it. 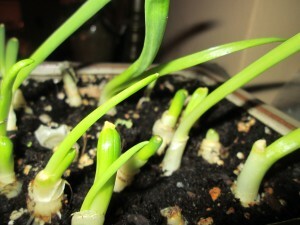 When you go to use your green onions just cut off the root, leaving about 1/4 inch of the white part. Place in the soil, water and wait. In a week I had some as long as 5 or 6 inches. When you use another onion- just add it to the pot. You can start celery and romaine lettuce pretty much the same way. Saw this idea a few weeks ago and decided to try it. I had cut off the stems from a stalk of celery. 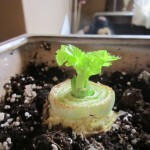 I placed the base of the celery plant in a pot with soil. Watered and waited. 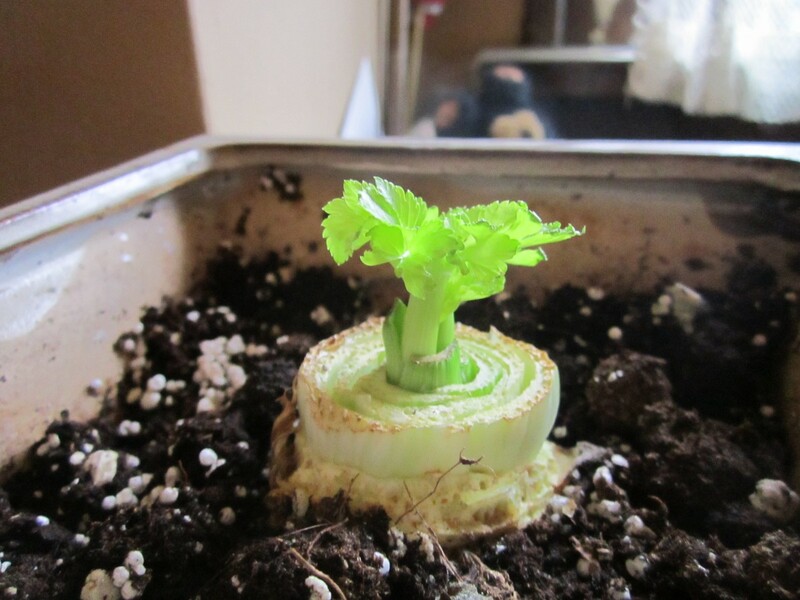 Now I have a new celery plant growing. Too soon to be planning the harvest but so far so good. Pretty cool, huh? While I look forward to most flowers in my garden the basil flowers are not my favorites. Basil is an annual and when the plants start to make flowers and eventually seeds the quality and quantity of the leaves diminishes. It is imperative to keep after the blooms and trim them off as soon as they appear. Trim down to just above where you see smaller leaves or new stems emerging. Before you toss the blossoms into the compost heap they do have another use. Like turning lemons into lemonade you can transform the basil flowers into another culinary purpose. You can use other herb blossoms the same way. I flavor vinegar with chive blossoms, lavender, roses and even lilac blossoms. You can later use them in salads, marinades and well, anywhere you use vinegar in cooking. It’s really simple. Just place clean blossoms into a clean jar. For every cup of blossoms add 2 cups of any vinegar you like. Be sure it is 5% acidity- the bottle will tell you and most vinegars are 5% acidity. Put on the lid of the jar and store in a cool, dark place for a couple of weeks- or longer. Once aged enough, strain then filter the vinegar and store in bottles until ready to use. It can be stored at room temp- but colorful vinegars- like chive blossom- will hold their color better when kept cold. There is something to be said for doing yard work on a cool day. I managed to clean out and prep the bed for greens and beets. Emptied out all the containers of compost I got from Carl yesterday at Blue Pike Farm. Thanks Carl. Worked them in to the herb garden and greens bed. Planted lots of basil, too. I have at least 24 in the ground and in large planters and still have more basil. Pesto for everyone!!!! Didn’t get everything done but this time of year there is always more to do. I did get distracted for a while by Parker and his pursuits. Parker is going to be 13 soon. 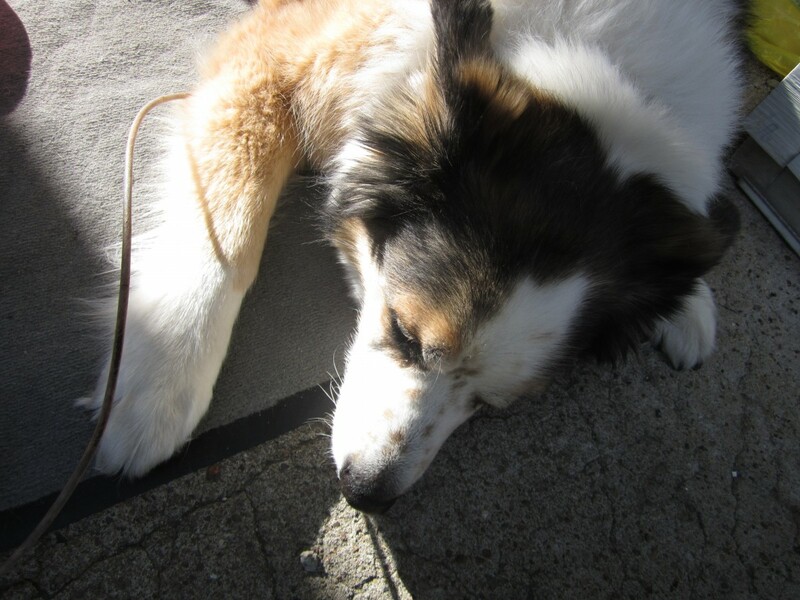 He is down to three legs and his remaining back leg gets a little stiff on cool days. 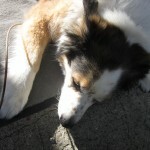 When he is with me in the garden he generally finds a shady place and settles in. Today was different, though. Today there were squirrels. A rowdy group of 4 squirrels were having a big time row about something. They chattered and ran up and down the tree next door. Its branches hang low into my yard. Parker was so excited he ran and barked and bounced around like a dog half his age. They even ran along the fence several times with Parker in hot pursuit. The “Gang of Four” went on with their fight for over an hour seemingly oblivious to the dog barking below them. First, let me say before my foraging friends attack me- I do not want you to kill all your weeds. Most are benign, some are pretty and many are edible. But sometimes there are plants in unwanted areas. I am referring to plants growing up in cracks in the pavement or sidewalks or between brick walkways. I used to pour boiling water on them- at it worked pretty well. But it is annoying if you have large areas to cover. It does notwork all the time, either. I got a post from a friend the other day suggesting using white vinegar. Cheap, eco- friendly and using it will make your yard smell like pickles. Now be advised- do not pour the vinegar onto areas where other desirable plants are growing. It will kill everything and mess up the pH of your soil. This is for use on concrete and other paved areas. Just pour vinegar over the plants and well, wait. It will take a few days to completely kill then but after day 1 they should be looking pretty sad. The pesky plants in my driveway are all brown and dried up. No dangerous herbicides around- extra important if you have children or pets and it is very inexpensive Let me know how it works for you. To keep the area weed free for the whole season mist the cracks every week with more vinegar. 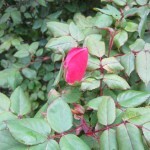 I cannot believe I have a rose blooming in April. 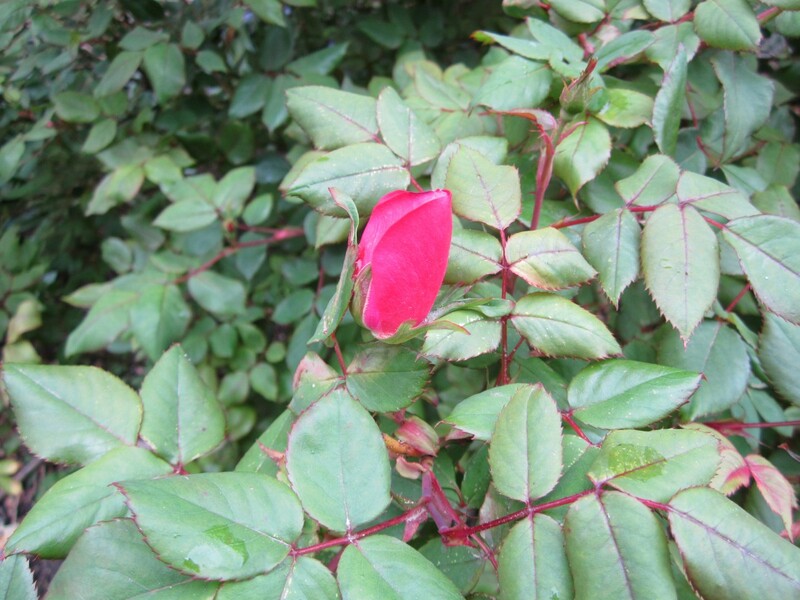 Because it has been such a mild winter my rose bush didn’t die back at all. It is taller than me already. Going to be a great year for roses. The Challenge: What’s for Lunch? First day of Spring and 80 days into my challenge of not going to the grocery store means being creative and resourceful. I was out planting peas today and decided to see just what was ready for harvest. I have really been been missing fresh greens. Sure, I have been sprouting seeds for fresh greens- but in between harvests just now. My harvest today consists of Swiss chard that has weathered our mild Winter, ramps, fennel greens, dandelion greens that are very tiny, but also less bitter at this stage, violet leaves, one violet flower and chives. Pretty decent haul for March in Cleveland! It will only get better. 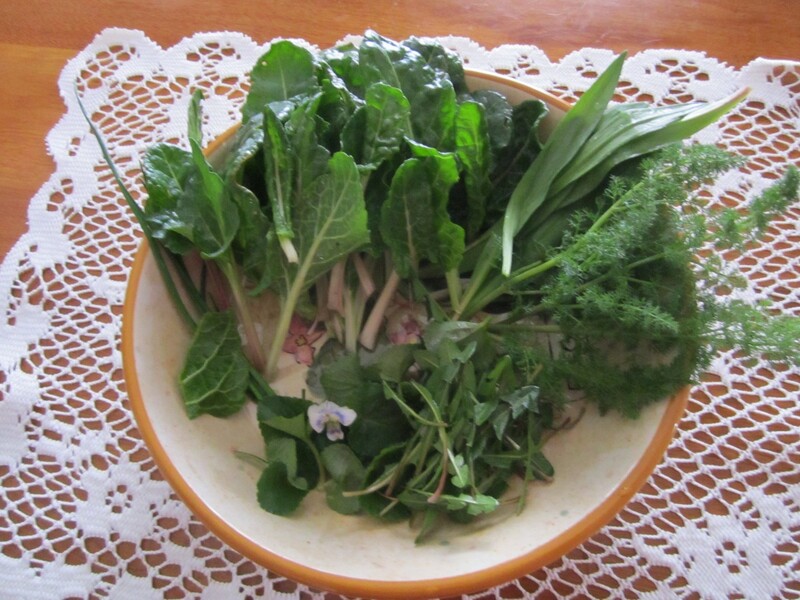 I thought of what Dr. Peter Gail taught me years ago about Spring tonics. Not to be confused with gin and tonic, Spring tonics were made from the first edible greens in the Spring. Prized by people in cold climates they signaled the start of a new year and thus fresh vegetables. 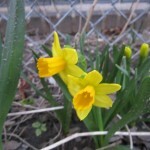 They were also full of nutrients that had been lacking during the winter. Our ancestors would crave them and I understand why. 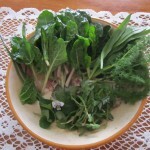 I can’t say that I have been lacking too much this winter but fresh greens sure sound good about now. Makes me also think about how much of what I grow is not edible. Inspired by Mari Keating and her group Food, Not Lawns. Their goal is to plant completely, or nearly completely edible landscapes. Sounding better to me everyday. Happy Spring!! 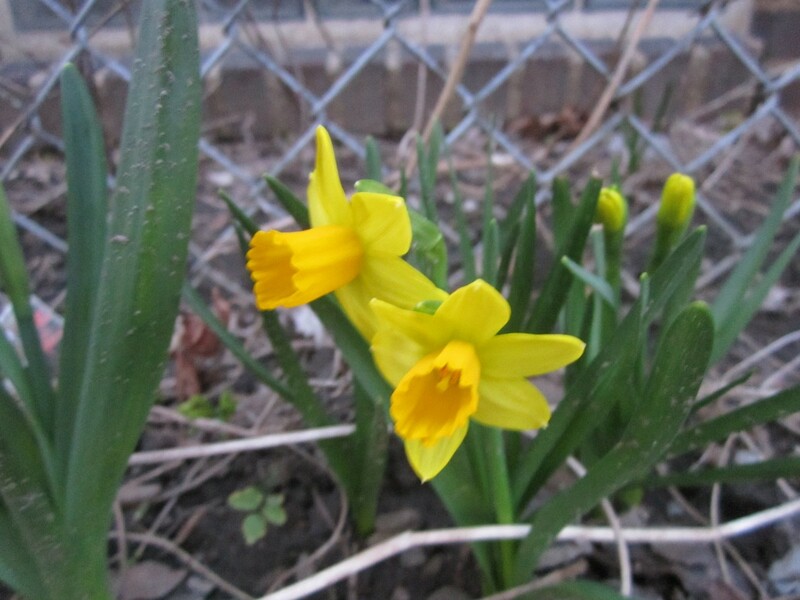 Did you know that daffodils are poisonous? They are. I am always encouraging people to forage. There are so many common plants that are both edible and tasty. As the new season starts I also want to be a little cautionary. As much as there are common plants out there that can nourish you there are also common plants that are dangerous and even deadly. Be sure you know what the plant is. If you can’t identify it for sure find someone who can. Your local Extension office can help. There are also plants where some parts are edible and others not -like tomatoes. Tomatoes are wonderfully edible but the foliage on tomato plants is poisonous. There are also plants that are only edible in certain stages of growth or when prepared a certain way. If you aren’t sure- don’t eat it!!!! While this is not meant to be a complete list here are some plants you should watch out for. Even more true if you have small children or pets that might ingest them. Some are quite toxic, others might cause skin irritations etc. I am so happy today. Getting ready to plant basil. 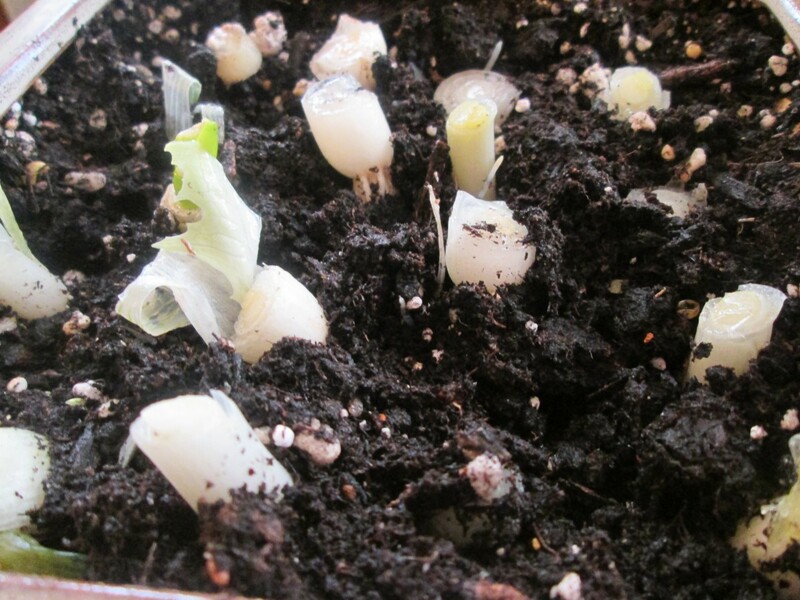 I have 2 dozen little plants which should give me a bountiful harvest all summer and well into fall. Basil is easy to grow if you follow a few simple tips. Basil likes warmth- don’t plant them in the ground until the soil in nice and warm. I am planting mine in containers today. Its probably too cold to put them in the ground yet. They also like plenty of sun. Full sun is considered at least 6-8 hours of sunshine every day. Before you plant basil make sure it will get plenty of sun. 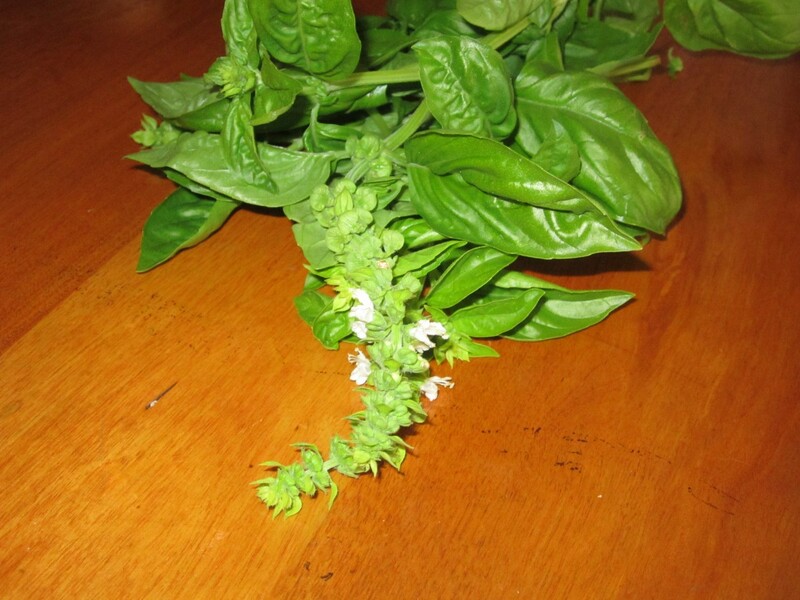 While you can use the flowers to flavor vinegar you really don’t want basil to flower too soon. Make sure it is in rich soil. Using some fertilizer will help the basil to grow lots of leaves. Basil is an annual- once it starts to flower it will produce fewer leaves and will not get as big. Baby it a little. Give it what it wants and basil will reap huge rewards. Harvest throughout the season but try not to take more than about a third of the leaves off the plant at any one time. This will be less stressful to the plants. 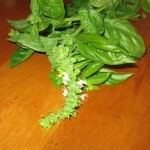 Basil is tender so you can just chop it as use it fresh in salads. If you want to preserve some for later use freezing works well. Air- drying basil will produce a sub-par product. Basil turns black when air-dried and should only be dried in a dehydrator. To freeze basil just place cleaned leaves in a blender or food processor. With the machine running pour in enough olive oil to form a mixture that is just barely thin enough to pour- don’t add to much oil. Pour or spoon the mixture into ice cube trays and freeze. Olive oil freezes solid so once the mix has frozen you can pop them out , put them in a freezer bag and put back in the freezer. Now you’ll have little cubes to take out and use whenever you want pesto or just a nice addition to a pasta sauce or salad dressing.